RICHMOND, Va. (March 1, 2016) – An awards ceremony honoring first responders from Hanover County and medical staff from Bon Secours Memorial Regional Medical Center will be held Wednesday, March 2, 2016, at 2 p.m. at the Hanover County Sheriff’s Office located at 7522 County Complex Road, Hanover, VA 23069. 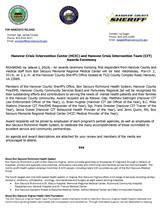 Members of the Hanover County Sheriff’s Office, Bon Secours Richmond Health System, Hanover County Fire/EMS, Hanover County Community Services Board and Pamunkey Regional Jail will be recognized for their outstanding efforts and contributions to serving the needs of mental health patients and their families in the Hanover County community. Award recipient are as follows: Dep. Matthew Gathright (Hanover CIT Law Enforcement Officer of the Year), Lt. Brian Hughes (Hanover CIT Jail Officer of the Year), B.C. Mike Watkins (Hanover CIT Fire/EMS Responder of the Year), Sgt. Frank Dressler (Hanover CIT Trainer of the Year), Jenna Dukes (Hanover CIT Behavioral Health Provider of the Year), and Jenni Quinn, RN, Bon Secours Memorial Regional Medical Center (HCIC Medical Provider of the Year). Award recipients will be joined by employees of each program’s partner agencies, as well as employees of Bon Secours Richmond Health System, to celebrate the many accomplishments of those committed to excellent service and community partnerships. An agenda and award descriptions are attached for your review and members of the media are encouraged to attend.